recently ‘ultra-short throw’ and ‘ultra-short throw interactive’ projectors. The shorter throw projectors are more fit-for-purpose than the longer throw, however despite these improvements, projectors still have a number of issues which cause problems and frustration to schools. The warranty provided on replacement lamp units is typically just for 3 months, which is too short. To facilitate high levels of natural external light in classrooms, where possible. The more recent technology that is challenging Projectors is Interactive Flat Screens (IFS). This is the same type technology that is used in flat screen TVs. Interactive flat screen technology has the potential to achieve the ‘objectives’ stated above, however the initial purchase cost is generally higher than the cost of a digital projector. The following table provides a summary comparison between Projectors and Interactive Flat Screens. 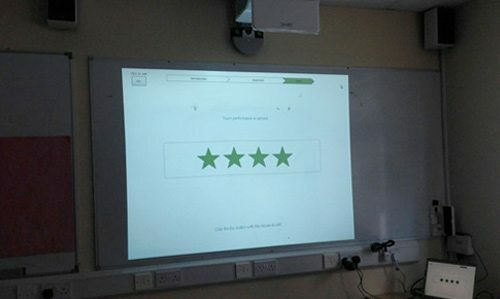 Uses conventional “projection” technology to project the image on to a surface or IWB. Note interactive projectors do not require an IWB. Image resolution quality can vary, though some projectors support high definition (HD). Image brightness fades over time requiring lamp unit replacement. A new replacement “lamp unit does not fully restore projector image brightness to its original quality. Only a very limited warranty (generally 3 months) on spare lamps units. Image fading may require classroom lights to be turned off or the closing of classroom blinds (leading to darker classrooms). Projector uses relatively more power. Noise factor: projector usually have a fan, so some can be noisy. Though projectors have an ”eco-mode” to reduce noise, this mode also unfortunately reduces image brightness so is of little value. Equipment warranty is generally 3 – 5 years, but can be less from some suppliers. Projector image size is generally bigger (typically 80 inch) than interactive flat screens (typically 65-70 inch). Projectors are lower cost than interactive flat screens. Total cost of ownership (including replacement lamp units or purchasing a new project after a few years, can be significantly higher than the original purchase cost. Uses integrated interactive flat screen TV technology, so a projector is not required. High definition (HD) image resolution quality or better is standard. Image brightness does not fade over time. Image brightness does not fade over time and so classrooms can remain bright – supporting a more appropriate learning environment. Flat screen LED technology uses relatively less power than projectors. No noise, so runs silently. Equipment warranty is generally a min of 3 – 5 years. Interactive flat screens size is generally smaller (typically 65 – 70 inch) than projector produced images. The larger interactive screens (80-84 inch) are much more expensive. Interactive flat screens are higher purchase cost than projector, however include interactive capabilites and so have much more uses. Apart from the initial purchase cost, the total cost of ownership should not be significantly higher than original purchase cost. Many of us are aware of this technology on the newer larger flat screen high definition (HD) TVs. 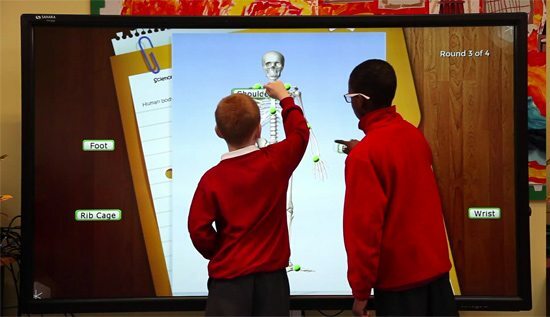 While interactive touch-screen capability may not be important for TVs, it is still important in (mainly Primary) classrooms where IWBs are mostly used, and more especially for younger pupils who enjoy interacting using ‘touch’ in classrooms. Though interactive flat screens are more expensive to purchase (ie., initial purchase price) than projectors, Table 2 shows that interactive flat screens have a number of advantages for teaching and learning in classrooms in comparison to digital projectors and interactive whiteboards. They have better image quality in terms of image resolution, giving a clearer and brighter image, and they can maintain this higher quality image over a longer number of years. Images projected by all Projectors (regardless of manufacturer) fade significantly after a few years, and continue to degrade. This becomes more of a problem when a classroom is bright (either from natural external light or lights within the classroom) and in these situations it’s more difficult to see a fading projector image, requiring the window blinds to be used to darken the classroom. A fading image projector’s value in the classroom can becomes compromised as they are unable to project the high quality image that is required. Projectors can suffer from reliability issues, including failing lamp units, and these can be quite expensive to replace. The image from a new spare lamp unit is generally not of the same quality as the original new projector. The industry standard warranty on new spare lamp units is generally 3 months, which represents very poor value. There are a number of different sizes of interactive flat screens. Though other sizes may be relevant in some situations, the two sizes that are generally being considered for school classrooms are the 65 inch and 70 inch sizes. (measured diagonally). Screen sizes of 80-84 inches are also available, and in an ideal world would be very attractive, however in practical terms, the cost increases for larger screen sizes, and as such these very large screens are very expensive and outside the budgets of schools. 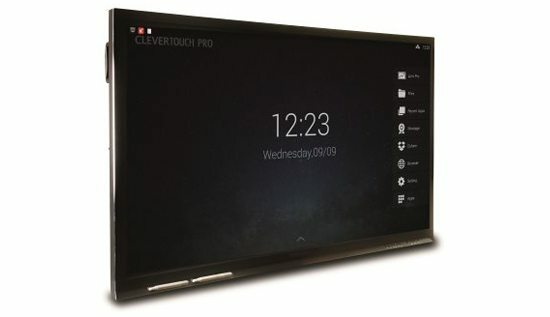 CLEVERTOUCH has enjoyed a great success in the past years in the UK. It is also estimated that over 11,000 classrooms have made CLEVERTOUCH Interactive Displays their first choice for this year.